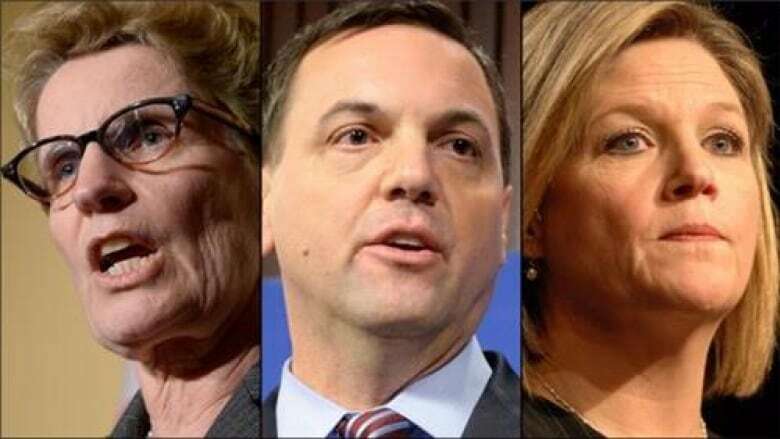 The Progressive Conservaties are blaming a scheduling conflict for keeping leader Tim Hudak from attending a northern leaders debate in Thunder Bay next week. The Progressive Conservatives are blaming a scheduling conflict for keeping leader Tim Hudak from attending a northern leaders debate in Thunder Bay on May 26. Liberal Leader Kathleen Wynne and New Democratic Party Leader Andrea Horwath have confirmed they'll attend the lunchtime debate on Monday. However, questions had continued to swirl around Hudak, who had not been listed on the debate's website. Early Wednesday afternoon, the PCs put out a news release saying the debate date didn't work for them. "Given the important issues that face the North it was our hope that there would have been an equal opportunity for all parties to communicate their plans for the North," the party said in the statement. "We were led to believe that there was a desire to have that comprehensive discussion." Horwath was critical of Hudak's absence at a campaign stop in Brampton Wednesday morning. "Last election campaign, it was the Liberals that gave a backhand to the North and this time it's the Conservatives that are giving a backhand to the North,” she said. “New Democrats have been there for the North from day one and we will proudly take part in the debate again this time around." Northwestern Ontario Municipal Association vice president Iain Angus said the organization would prefer the leaders of all three major parties take part, but it will proceed with Wynne and Horwath. Angus also noted that a debate in Thunder Bay during the 2011 election campaign involved PC and NDP leaders, but not Liberal leader Dalton McGuinty. McGuinty cited scheduling issues as well when he passed on that debate, which led Hudak to say at the time that McGuinty had "turned his back" on northern Ontario. The two Progressive Conservative candidates in Thunder Bay said the lack of Hudak's presence at the debate does not worry them. "I'd like to think that it means he's got confidence in the people that are part of the team to be able to carry this," said Harold Wilson, who is running in Thunder Bay-Atikokan. Wilson said candidates, including himself, have been very involved in developing the party's platform for the north. Monday's debate is open to the public, but registration is required and there is a fee of $45. What would you ask the leaders during the June 3 leaders debate? Email us at ontariodebate@cbc.ca and you may be chosen to ask your question on-camera during the televised broadcast. Please include your contact information.